When we talk about natural and organic food, what is it that's different about it? The US Department of Agriculture Organic Program, Consumer Brochure says: "Organic food is produced without using most conventional pesticides; fertilizers made with synthetic ingredients or sewage sludge; bioengineering; or ionizing radiation." The use of chemical pesticides has gotten to the point that almost everything we eat and drink is contaminated unless it is organic. Pesticides not only contaminate the food sources in the fields they are sprayed on, they contaminate the foods made for humans from them. They contaminate the meat of the animals that eat the food sources that are sprayed with them. Likewise the dairy products and eggs, etc. are contaminated as well. The Environmental Working Group did some research recently based on US Department of Agriculture findings from contamination tests of fruits and vegetables. Their findings regarding the levels of pesticides in food, along with the additional information they provide on the hazards of exposure to pesticides, is very much an eye opener. These documents serve to reinforce our belief that, as a minimum, it is vital that moms, moms to be and small children should be eating organic food. In reality, everyone should be eating organic food. Everything from organic vegetables to organic comfort foods is becoming increasingly more available at local supermarkets. From small mom and pop stores to the biggest of the big, Wal-Mart, everyone seems to be getting in on the organic living movement. Some organic foods such as organic meat, "true" wild salmon and seafood, organic berries, and organic nuts are more difficult to come by. Laurie Demeritt, president and CO, of the Hartman Group, a market research firm says, "nearly 75 percent of Americans buy organic products at least occasionally, while 23 percent go organic weekly." Having a child is given as the most significant reason to go organic. Also, anyone whose immune system is weak should seriously consider eating natural and organic. Many, many of the chemicals being used on fields are know to cause certain types of cancers. By eating organic when ever possible you will be taking one more precaution against cancer. Follow this link for additional information on other ways to prevent cancer. Sue Moores, spokesperson for the American Dietetic Association and a nutrition consultant says, "Organic practices affect how food is grown and, in some cases, that may yield more nutrition." Organic fruit and vegetables develop stronger compounds to protect themselves. If you eat that produce, you get those disease fighting compounds, too. Looking for ways to prepare your organic food? Here's a source for some good, quick and easy natural health recipes. This is a good place to start. Many people are discovering that they can't find good quality organic fruits and vegetables in their local market. Since they can't find the produce they want in their markets many of them are growing some of their own organic food. Just because an item of food has an organic label on it doesn't necessarily mean that it's really all that healthy. Look at the ingredients. You may find that it contains things that, for your health, you should limit the amounts you eat....LIKE SUGAR. In the late 1990's we started to notice that the taste and smell of dairy products was changing. No longer did they have that fresh from the farm aroma that most of us grew up with, instead it sort of smelled more like the barnyard. Not a good thing. We didn't understand back then what was going on. We just knew we couldn't get past the smell and started reducing our use of dairy products. Then one day we purchased some organic milk at the grocery. WOW! it smelled and tasted like what we both remembered from the good old days. On our organic dairy page we share with you what we have found out about what's been going on "Down On The Farm". We'll also fill you in on the serious health risks that you're being exposed to if you're not using organic dairy products. Over the past few years organic dairy products have become more available, especially organic milk which can be found in almost any decent grocery market. However, organic cheese and other organic dairy products are a bit more difficult to find. Non-organic meats come from animals that are literally pumped full of antibiotics and hormones and eat from crops produced using pesticides, herbicides, chemical fertilizers and genetically modified organisms (GMO's). Unfortunately those chemicals are then passed on to those who eat the meat. Who knows what problems these chemicals are creating for a developing fetus who's mother eats this meat? What long range health problems are all of these chemicals creating for the human race as a whole. We provide information about the great health advantages of eating organic meat and the potentially devastating health consequences of eating non organic meat especially processed meats. Did you know that the nutritional values in organic grass fed beef actually promote weight loss? When we talk about natural and organic food, natural is used to denote food sources such as wild fish and other seafood which are harvested in their natural environment of the ocean. These cannot truly be called organic as there is no possible way to regulate what they are exposed to in the ocean. 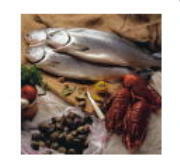 In recent years there has been an increasing amount of fish on the market which comes from fish farms. Fish farms are nothing more than extremely over populated, chemically polluted cesspools. Follow this link to learn more about fish farms and why they are such a great threat to your health. Blueberries, raspberries and strawberries are great sources of vital nutrients that most of us don't get without taking some type of supplement. However, raspberries and strawberries are on almost every list of the most contaminated fruits and vegetables when grown using conventional methods. Because of this it only makes sense to buy organic berries when ever possible. With that in mind, we highly recommend that everyone not only make berries a daily part of their diet but that they make every effort to obtain organic berries. Nuts have long been know as excellent sources of protein and good fats. What most people don't know is that organic nuts are also a great source of vital nutrients essential to weight control, heart health, cellular energy and a superior plant source of Omega-3. Because of the exceptional health benefits of eating organic nuts, everyone should include them as part of their daily diet. When making the decision to buy natural and organic food, organic meat, wild salmon and seafood, organic berries and organic nuts are often overlooked because they aren't usually available at the supermarket. We're here to provide resources for you to be able to make natural and organic choices.